Mention the words “trading cards” and for many people, images of baseball, hockey or football-oriented memorabilia may immediately come to mind. But for a lot of non-sports cards enthusiasts, the term may instead rekindle memories of the many wonderful horror and science-fiction-themed trading cards of the 1950s and ’60s. Featuring photos or illustrations of their favorite fright fiends and aliens from TV and the silver-screen these cards were offered in assortments of usually five to eight cards a pack and came complete with a stick of pink (and admittedly hard-to-chew) bubblegum – all stuffed inside a wax-coated wrapper. Whether creepy, spookily amusing or simply off-the-wall bizarre, these beloved “wax packs” are evocative of a simpler time when neighborhood children collected and traded the cards amongst themselves or friends in the hopes of completing an entire set. Of course, there was always that odd card that would find its way within the spokes of its owner’s bicycle wheel – which made a great flicking sound with each spin of the wheel along the pavement. Though sports trading cards (baseball, in particular) had been in existence since the late 1800s - offered as premiums in such products as cigarettes and chewing gum, the first horror and sci-fi oriented trading cards sets were not produced until much later. Cards with a science-fiction slant were available as early as the 1930’s, but tended to be offerings touting the “technological marvels of tomorrow” as opposed to alien beings and space travel. And with horror entertainment considered adult-only fare up until the late 1950s (even early ’50s horror-based comic books like the EC Comics-published Tales from the Crypt, The Haunt of Fear and The Vault of Horror were cited as being psychologically damaging to children and a cause of juvenile delinquency), such cards were not manufactured. However with the progression of the decade there was a bit of a relaxation with respect to social norms and the way horror entertainment was viewed and this coupled with a TV sensation called Shock! Theatre and a magazine called Famous Monsters of Filmland was to bring kids, monsters, aliens and trading cards together at last. Making its debut in late 1957, Shock! Theatre was the first-ever television broadcast of classic Universal monster movies in a syndicated format package. Consisting of classic flicks like Dracula, Frankenstein, The Mummy and The Wolf Man the films were often introduced by costumed hosts and were immediately and immensely popular with youthful audiences. Likewise, the arrival of a brand-new publication to newsstands called Famous Monsters of Filmland helped to further cement the appeal of monsters to kids across North America. Debuting in February of 1958, Famous Monsters was jammed packed with monster movie news and eye-opening photos - all topped off with humorous text and captions courtesy of its Editor-in-Chief, Forrest J Ackerman. With this flurry of monster activity (as well as the many sci-fi creature features playing cinema and drive-in screens) it was only natural that a trading card set would soon make its way off of production lines and into the hands of kids. That series would be Funny Monsters aka You’ll Die Laughing. The first true genre trading card effort, Funny Monsters was released by the New York City-based Topps Company, Inc. in late 1959. Featuring all the traditional fiends like the Frankenstein Monster, Dracula and the Wolf Man, the series was different from a lot of later monster-themed card lines in that it eschewed traditional film still images in favor of madcap full-color illustrated artwork (by renowned Mad Magazine cartoonist Jack Davis). Using amusing, pun-filled captions for the drawings and featuring jokes on the backs of the cards, it was along the lines as to what was being done in the pages of Famous Monsters, but with a decidedly goofier, more comedic tone. Although packaged in wrappers imprinted with the Funny Monsters name, the cards are also widely known as You’ll Die Laughing – as this title was prominently featured as the header on the back of each card. 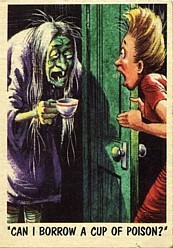 The next line of horror cards was released in 1961. Called Horror Monsters, they were produced by the Nucard company and were released in two series. 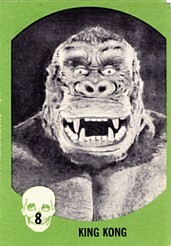 Featuring green and orange tinted photos of various horror and sci-fi flicks like Revenge of Frankenstein, King Kong, The Mole People, Creature From the Black Lagoon, The Alligator People and Invasion of the Saucer Men the first series of cards featured green borders and a neat little skull design on the front bottom left hand side to display the card number. The second set featured an orange border and a plain circle image to display the card’s number. Both series featured monster illustrations on the back of the card along with various jokes, but the first series is significantly rarer than the second and can fetch on average around $500 in mint to near-mint condition, with the second series worth about half that amount. The following year would see the release of the most notorious trading card sets made up till that point: Mars Attacks! Released briefly in 1962 by Topps (again under their Bubbles, Inc. name), Mars Attacks! told the story of Earth under siege by malicious, horrible Martians. 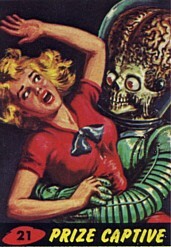 As painted by renowned pulp-comic artist, Norm Saunders, images for the controversial full-color cards featured the capture, imprisonment, torture and killing of humans (and their furry, four-legged friends) at the ray-gun toting hands of the pitiless aliens and their oversized insect and robot minions. Kids loved the hilariously shocking (even to this day ) artwork and captions, but the outrageously lurid and graphically gory illustrations led to a storm of protest from angry mothers who demanded that the cards be removed from store shelves. As a result, production on Mars Attacks! was abruptly halted with just fifty-five cards produced. Incredibly difficult to find nowadays, anyone attempting to obtain a set must be prepared to spend upwards of several thousand dollars. Attracting a strong and highly devoted cult following over the years the line even spawned a 1996 Tim Burton-directed movie and a reprinting of the entire line along with additional, newly created cards complete with retro-styled artwork. Also in 1962 kids got a chance to get their hands on the Spook Stories line from Leaf. Available in two different series and consisting of seventy-two very nicely printed black-and-white cards each, the cards carry a copyright date of 1961, although they weren’t actually available at that point. In addition, the line also came with a set of approximately forty-eight smaller "lick ’em" stickers. Similar to postage stamps, they would require moisture to affix to an object. Unfortunately, a large number of counterfeit stickers are available on the market, so in order to avoid fakes collectors must be careful to ensure the adhesive on them appears even and factory-applied. The first series of the cards can sell for about $200 on the collectors market, with the harder-to-find second series going for roughly double that amount. In 1963, Famous Monsters Magazine was at the top of its form and the Rosan company released a bubblegum trading card set that year based on horrordom’s most famous publication. Consisting of sixty-four black-and-white cards, the series featured images of all the classic monster films of the day, framed with orange borders. The backs of the cards were similar to the ads found within the magazine itself and were a showcase for Famous Monsters’ “Captain Co.” products such as official masks, posters, rings, rubber bats and other novelties. Complete sets are somewhat easier to find for this series and can be bought for $100 to $150 in near-mint condition. The year also saw the release of Monster Midgees, also referred to as Monster Laffs Midgees. Comprised of 153 smaller cards (one-third the size of a regular one) they were printed in panels of three, which could then be separated into three different cards. 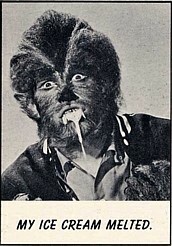 Containing wacky jokes on the back, the series featured many great black-and-white images from such films as I Was a Teenaged Werewolf, Konga and The She Creature. Very difficult to find in mint, un-separated (untorn) condition, a complete set can now go for up to $2000. 1964 was a prolific year for monsters and aliens on the small screen and card sets were issued for television series such as The Munsters, The Addams Family and The Outer Limits. 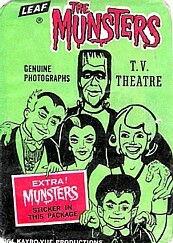 Produced by Leaf, The Munsters came in a set of seventy-two black-and-white cards and sixteen smaller color illustrated stickers depicting all the show’s characters: Herman, Lily, Grandpa, Eddie and Marilyn. 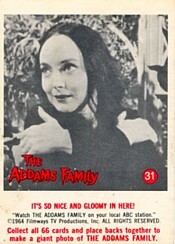 Produced by Donruss, The Addams Family line was available in a set of sixty-six black-and-white cards comprised of images of Gomez, Morticia, Uncle Fester, Lurch and the gang. The set could also be collected to form a large poster using the back of the cards. The Outer Limits was an impressive set that was released under Topps’ Bubbles, Inc name. Comprised of fifty full color cards, they featured mini stories on the back each card. Very popular with collectors of sci-fi, horror and TV memorabilia all the above sets can command prices of several hundred dollars apiece. 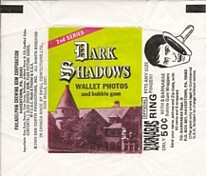 The 1960s Gothic soap opera Dark Shadows was a hit during its run-inspiring a mountain of merchandise, among it, two sets of trading cards, referred to as “Wallet Photos” on the wrapper. The first set was issued in 1968, at the height of the program’s popularity, and was comprised of 66 different black-and-white stills framed by a pink border, with many of the pics being of the show’s star: a 175-year-old vampire named Barnabas Collins. Released the following year in 1969, the second series also consisted of sixty-six cards, this time framed by a green border and focusing on the show’s other lead character, ghost/werewolf Quentin Collins. Selling for 5 cents apiece, card wrappers carried a tie-in promotion ad allowing fans the chance to buy an authentic plastic Barnabas ring for only 50 cents plus five gum wrappers. Now an ultra-rare collectible (as the ring’s cheap quality led to many of them being discarded) the item can command prices of several hundred dollars when sold nowadays. Other cards releases of the ’60’s include Topps’ Monster Greetings, a set of fifty cards illustrated by renowned counter-culture artist, R. Crumb in 1965 and Monster Laffs – another set of fifty humorous horror cards released by Topps in 1966. 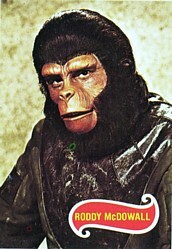 Additionally, a set of movie cards based upon the sci-fi classic Planet of the Apes was released by Topps in 1969 and featured great full color scenes from the film including those of stars Charlton Heston as astronaut George Taylor, Roddy McDowall as the chimpanzee archaeologist, Cornelius, Kim Hunter as his wife, Zira and Maurice Evans as the evil orangutan, Dr. Zaius. Affectionately remembered and prized by their owners (both young and the young-at-heart) these classic trading cards captured a time when there was innocence and a good natured charm to sci-fi and horror films - something that is lacking nowadays. We may have grown older, but that doesn’t mean we love our old “wax packs” any less. Here’s hoping that the children of tomorrow enjoy their trading cards as much as we did (and still continue to do). James Burrell is a Toronto-based writer whose work has appeared in several Canadian publications including the award-winning Rue Morgue. He is also an avid collector who has been acquiring vintage monster, superhero and science-fiction toys and movie collectibles for twenty-five years.